In addition to our innovative programming, The Lab has numerous partnerships that position it to play a central role in the globalization of US theater, and in integrating the voices of those impacted by crises around the world into policymakers’ conversations about them. Linda Zachrison, Counselor for Cultural Affairs at the Swedish Embassy, Samia Farouki, SFS Dean Joel Hellman, and Ambassador Cynthia Schneider at the reception for World Theatre Day in 2017. 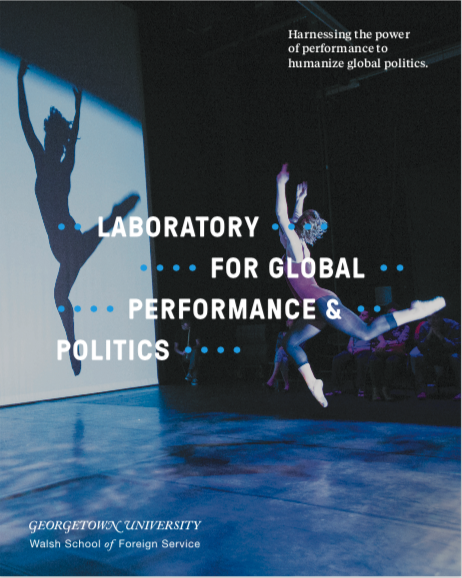 In the six years since The Lab’s founding, we have presented or produced 16 workshop or full-scale productions, hosted 31 convenings, symposiums, and discussions, as well as 8 residencies; partnered with more than 65 theaters, embassies, and cultural institutions, published 43 articles, and presented work from over 30 countries. Through this range of programming, The Lab breaks down stereotypes and reframes today’s problems in humanistic terms.